I know...I know...what the hell is TEMPEH, right? For a long time I only thought of it as the weird bumpy package that sat beside the Tofu in the market. But, maybe you're like me; have a vivacious curiosity and a giant desire to eat healthier. And, maybe like me you just need a little more info and a few minutes to experiment. 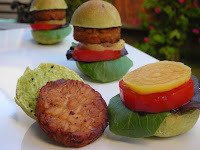 If so, then you're gonna love this little TEMPEH BURGER. 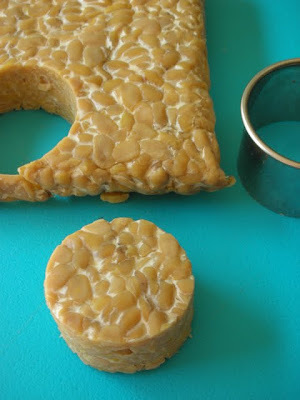 Just to be factual, and use my new found knowledge: Tempeh is a cultured cake of beans and/or grains originally from Indonesia (one of the only soyfoods not from China). It's fermented, and when cooked properly has a nutty, meat-like, earthy...I'm making myself hungry, again...hardy bite. Tempeh contains more protein than chicken or beef, and loaded with Riboflavin and Manganese (which helps our bodies utilize nutrients, keeps bones strong and provides good function to our thyroid and nerves.) You won't read that on a Happy Meal box. It took the US until the late 1970's to really get on board with Tempeh - but that was also the time we had the most growth in our national awareness for health, world hunger, fitness and childhood nutrition. Class dismissed, time for Kitchen Playground. Cover and turn over a few times while marinating to make sure all pieces are flavored. Remove burgers and place on mini-rolls with condiments of your choosing. 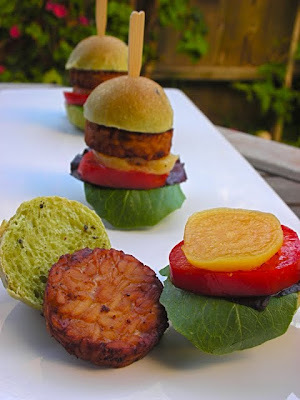 For my Tempeh Sliders: I used Vegan Mayonaise, roasted Yellow Beet, Roma tomato, Baby Romaine lettuces and placed them on a Green Tea/Black Sesame hand-made roll. I developed those rolls for "Fete du The" by ALGABAR. These would make great appetizers, small plates or just cut them bigger and serve for a full burger meal. ALSO, the scraps, from the tempeh not cut out, can be marinaded along with the burgers and also sauteed. I held them in the fridge and sprinkled them over a salad the next day. OMG, very deep, nutty and delicious topping for greens with red onions and roasted curry cauliflower. Try it, impress your friends...impress your body. Attempt Tempeh! These looks wonderful. It has definitely inspired me to use tempeh. Great post for LetsLunch! Yum. I love tempeh, but haven't eaten it in a long time. Thanks for reminding me that it's out there! Just gorgeous!! I LOVE garam masala in anything. 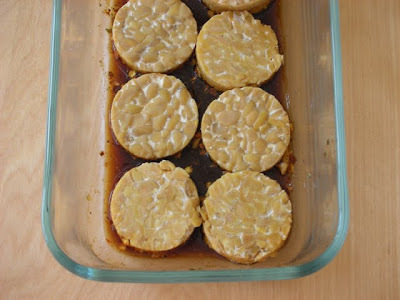 I haven't had tempeh in a long while, too...time to buy some. Yum! I am super hungry now. Those burgers look really good.